** This is not a sponsored post. As an ambassador for Brass Clothing, I did include affiliate links in this post, so that means I would make a small commission if you use the link to make a purchase. As always, I only share products with you that I truly like! Isn’t it wonderful to find a clothing company you can just plain rely on? Today I wanted to chat with you about Brass Clothing and share several of my favorite pieces from their site! 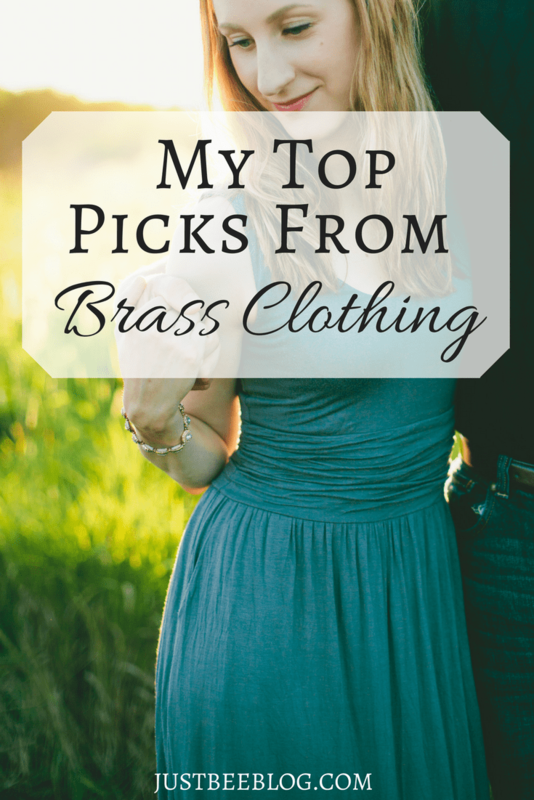 I love turning to Brass Clothing for some of my clothing needs when I am looking for versatile basics! I love Brass Clothing for several reasons. First, they take their mission very seriously. Brass wants to steer clear of the “fast-fashion” or “disposable fashion” industry, instead providing women with quality pieces to add to a put-together wardrobe. Second, it is so neat to see how they focus on creating a capsule wardrobe that women can use for work or for play! Capsule wardrobes are relatively popular right now, with many of us trying to mix and match quality pieces. Third, I really like Brass just because I love the fit of their clothing! I’d found that some of my most flattering outfits are built using Brass pieces that I own. The clothing items I’m sharing below are in no particular order, but they are ALL pieces that I personally own and wear!! This tank is an awesome layering piece! It’s a lovely, soft tank that feels equal parts drape-y and fitted. It is cute worn alone but works really well under cardigans or sweaters, too. Boy, do I love this shirt! It feels like your favorite, worn-in T-shirt, but it looks a heck of a lot more classy! 😉 Again, it feels super soft like the tank does, but it has a different kind of cut. The sleeves are a bit longer, which adds interest. I wore this shirt all the time when we were in Europe, but who am I kidding? I love wearing it all the time during the warmer months! Color-wise, it says it is “Charcoal” but it looks more like a perfect purple-y gray. ** on sale right now! This shirt just may be my favorite shirt of all time! (But I seriously love that scoopneck tunic, too.) The V-neck tee comes in black and has a not-too-deep “V” that is both flattering and appropriate to wear anytime! I wear this one all the time. It works so well layered under sweaters, but it’s super cute worn alone. This is my favorite dress everrrr. 🙂 It is super flattering and comes in 3 colors. I own it in Dove Gray and in Black, but it also comes in Navy. It’s made of a soft knit jersey (are you seeing a theme here with soft textures?!) and has a beautiful gathered waist. It does fit quite snugly around the rib cage, so if you’re a little larger on top, you’ll want to size up. This dress pairs beautifully with a sweater or jean jacket, but it is cute worn by itself on a hot day! This dress is super cute. It’s a soft but heavier material, and I love the gray color of it! (It also comes in Olive.) I don’t wear this one as much as I wear the other items, but it sure is a great basic sweater dress to add to your capsule wardrobe. Shirt dresses like this one are so versatile! They are great for both work and play! I love black in my wardrobe, so this dress is great and flexible with any color scheme. The collar is a bit unique and I like that, as I don’t always love a collar right up against my neck. Have you heard of Brass Clothing before? Are you building a capsule wardrobe? The dresses are SO cute!! I might need to get that black maxi!